Scruffy and Charlie, my most recent boarders, have gone home. I'm pretty sure they enjoyed their holiday and I refined my skills at multi-dog management. I owe a lot of this to another little guide: P. McConnell and K. London's Feeling Outnumbered: How to Manage and Enjoy Your Multi-Dog Household. I loved its advice on body blocking, and its general approach of 'teaching every dog good manners is the key to peaceful coexistence'. Makes perfect sense to me. Most of all, though, I think this sudden foray into multi-dog management -- with Scruffy and Charlie at home, and Ava and Darcy at work -- has made me feel like the key here is management. Don't get me wrong -- dogs do need to be trained and you can almost always teach something new to improve situations. That's why I'm a dog trainer. But I've also realised that management can be enough. Ava: You call this management? With multiple dogs, your time is split between them. Add to that normal life commitments -- for example, a homework assignment to finish, another dog job, and trying to fit in driving practice -- sometimes it's just about getting the dogs fed, walked, and getting in a little mental stimulation, whether that be with toys or training. And I feel like part of understanding management is understanding that you won't be able to treat both dogs the same. Little Darcy, being only a few months old, spends half the day in his pen, while Ava can be trusted free in the house. Scruffy has to eat outside by himself while Charlie is inside with the humans, because Charlie needs to be coaxed to eat and Scruffy will steal his food. You won't even be able to treat your dogs equally all of the time. Some days only Darcy gets walked, because I can only take one dog with me to the cafe, and some days only Ava gets walked, because I'm out of time. And you know what? I'm realising that's okay. Don't get me wrong, I wish Ava and Darcy could loose-lead walk nicely right now so that I could just walk them both together, and I really, really wish Scruffy and Charlie's owner could implement some more strategies so Charlie doesn't have to live timidly in the shadow of his brother. But I'm hoping that the more dogs I work with the more skilled I will become, so that I can achieve more in the same finite amount of time. Until then, though, I'm only human, they're only dogs, and we do the best we can. Yup - sounds about right. Managing four dogs is a challenge at times. We have slight jealousy sometimes. After all, it's all about Sam, right? Oh yes, my sister likes the snow. Slush and rain - naw, she'd prefer to stay indoors. Two is tricky enough - I can't imagine four! I think Tuvia has the right idea - I'd stay indoors in slush too. Thoughts? I'd love to hear them! It's officially Ellen, but they call me Melon. I'm an Aussie dogsitter, obedience instructor and lifelong learner. I'm passionate about education and food that makes you happy. Cavalier King Charles Spaniel born Dec 2015. Less than 48 hours after she arrived home, I became her official dogsitter and unofficial third parent. Raising Ava was a big adventure but now she's my sidekick for even bigger adventures. Born Oct 2016, Darcy is Ava's mischievous little brother: the Loki to Ava's Thor. He loves you and will give you kisses whether you want them or not. My friend's Japanese Spitz. We've worked on her anxiety and frustration and she stayed at Camp Melon in August 2015. Scruffy the boofheaded wire fox terrier always keeps me entertained when he comes to visit (often with his 'doodle brother Charlie). My friend's cheeky labrador is the one who started it all when I walked and trained her back in 2013. She remains the youngest 'old dog' I've ever met. This blog was born as 'Life as a Piggie' and documented the trials and tribulations of Cocoa the guinea pig, who lived 8 years without a bad hair day. 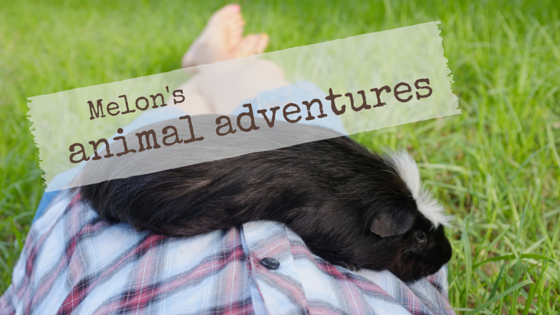 His hooman Melon strives to live by what he taught and have many more animal adventures.